Most of the time when we think of bullying we only see two parties as being involved; the bully and the bullied. 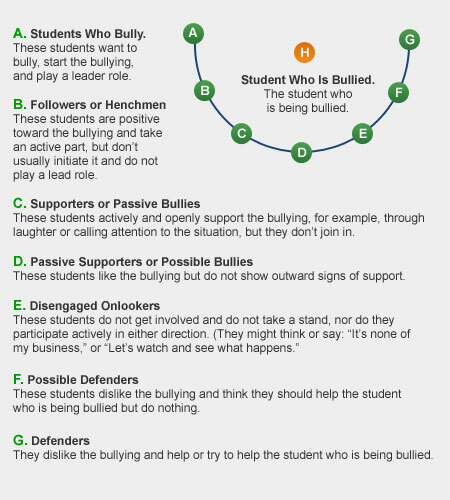 Olweus theory suggests that everyone plays a role in bullying. If this is true then to combat bullying would require a collaborative effort by all parties. Below is a diagram of the various parties involved in bullying. After seeing this chart I began noticing the specific roles in the youth in our community. Bullying is a systemic problem that requires a well thought out approach if we are going to quell this dangerous behavior and it’s consequences. 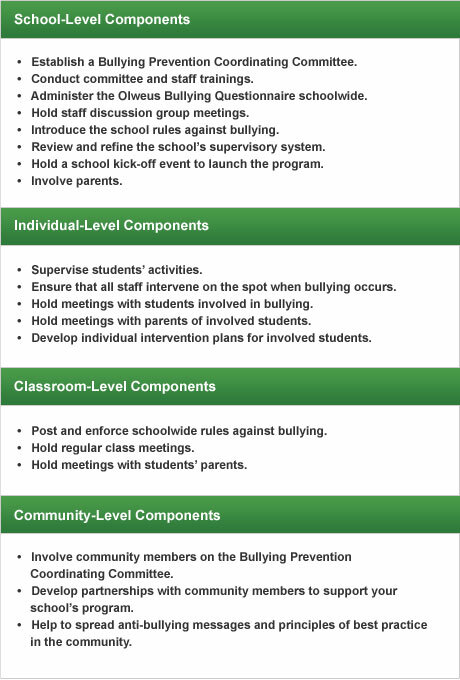 Below is Olweus’s components for addressing bullying in our communities. Our churches and ministries can and should take the lead in confronting this behavior and implementing a plan of action to address bullying. What might it say should a church take the lead in this fight? What does this communicate to our kids when a community fights for their safety? How does this impact an adolescents search for identity and autonomy?